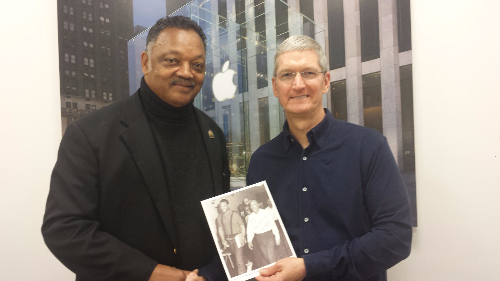 I want to thank you, Tim, for meeting me in December and for allowing me to present to you and Apple shareholders today. Last week while was in Alabama, I was struck by the unbroken line from Selma to Silicon Valley – a part of the long journey for equality, human rights and economic fairness. Silicon Valley – and African American and Latino communities – are looking for leaders – leaders who will step forward as the Dr. King or John Lewis’ of this era. Tim, I believe you and Apple, have the vision, commitment and courage to help usher in a new era of diversity and inclusion. This commitment is demonstrated in your announcement today of a $40 million grant to the Thurgood Marshall Fund to prepare, educate, and hire young people – especially in the HBCU’s – to work and innovate in technology. This is a historic commitment. I appeal to you and Apple to set concrete goals, targets and timetables to achieve your diversity and inclusion objectives, and seek full representation by 2020. And I appeal to you to put in place an active mentorship and promotion program to bring more people of color in your top leadership. Apple is one of the greatest innovators in the world – – – from the IPad and IPhone and now the IWatch – you make products that transform the world. I urge you to use that same power and genius to transform the culture of Silicon Valley – to transform the workforce, leadership and Boardrooms to look like America and the communities you depend upon for success. To use that genius to unlock the vast untapped human potential – wherever it may be: in India or in East Oakland, in China or on the Southside of Chicago; at MIT or at A&T or Morehouse. Build your Apple Stores not just in the suburbs but in the African American and urban communities. President Obama said in Selma this weekend “the march is not yet over.” In Silicon Valley, the march for diversity and inclusion is just beginning. Several companies are implementing new diversity and inclusion strategies, most notably Intel’s landmark $300M Diversity Initiative. I’m sure you would agree that there is much more to be done and many formidable challenges ahead. Apple and this thriving Silicon Valley are solving the world’s most challenging and complex problems. Diversity and Inclusion is a complex problem – if we put our collective minds to it, we can solve it, too. Tim, with Apple and your creative leadership, sensitivity and commitment, we know it can be done. Let’s close the gaps together. Let all of share in America’s growth and opportunity. Let’s win together.